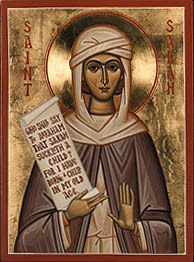 The Righteous Sarah, wife of Abraham and mother of Isaac. The holy and Righteous Sarah is a key figure in the Lord's Covenant with Israel. She was married to Abraham, the Old Testament Patriarch; eventually she bore him a son, Isaac, though she had previously been barren. Sarah died at 127 years of age. She is included in the commemoration of the ancestors of the Lord on the Sunday of the Forefathers in December. The story of Sarah and Abraham can be found in Genesis 12-23. Sarah was originally called Sarai (שָׂרַי / שָׂרָי "My princess") and lived with her husband, then called Abram. This page was last edited on September 4, 2007, at 17:31.